Heart transplantation is a life-saving operation for patients with end-stage heart disease. Despite this reality, the transplantation number does not increase over the years. One of the most limiting factors is the lack of donor organs and a conservative allocation policy that results in the loss of about half of the organs being offered. An improved prediction of the operation outcome would augment the confidence in the post-transplantation performance and make it possible to optimize the allocation of organs. The goal of the AAOT project is to develop algorithms to predict most accurately the survival time of heart-transplanted patients. We developed algorithms based on machine-learning techniques, such neural networks that take parameters from the donors and the recipients as input and produce a survival time as output. The objective is to minimize the difference between the prediction and the actual survival time that we extract from international medical registers. We have completed a study that statistically prove that the prediction algorithm previously developed by our group at Lund, IHTSA, showed a superior accuracy compared to the popular IMPACT program. We developed a web application that lets users enter recipient and donor data and that outputs a survival prediction. We also carried out an analysis to find locally optimal feature sets to predict survival of HT patients for different time periods. To this end, we applied logistic regression together with a greedy forward and backward search. As data source, we used the United Network for Organ Sharing (UNOS) registry, where we extracted adult patients (>17 years) from January 1997 to December 2008. 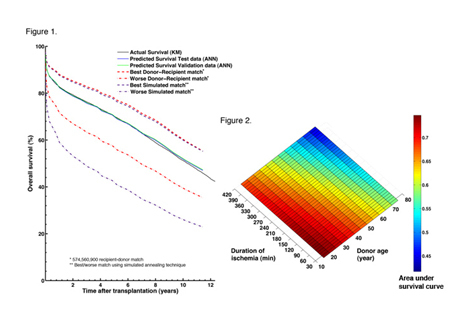 As methods to predict survival, we used the Index for Mortality Prediction After Cardiac Transplantation (IMPACT) and the International Heart Transplant Survival Algorithm (IHTSA). We used the LIBLINEAR library together with the Apache Spark cluster computing framework to carry out the computation and we found feature sets for 1, 5, and 10-year survival for which we obtained area under the ROC curves (AUROC) of 68%, 68%, and 76%, respectively. Finally, we are completing the implementation of Simulation for the Allocation of Hearts for Transplantation and we are writing a paper that describes the experiment and the results. Selection of an Optimal Feature Set to Predict Heart Transplantation Outcomes. Comparison between the Index for Mortality Prediction After Cardiac Transplantation (IMPACT) and the International Heart Transplantation Survival Algorithm (IHTSA). Simulating the Allocation of Hearts for Transplantation.